In the bowl of your stand mixer weigh out the bread and spelt flour. On one side add the active dry yeast. On the other side so it doesn’t touch the yeast add the sea salt. Place the bowl on the mixer and fit it with the dough hook. Add the agave nectar, apple sourdough starter and warm water. Turn the mixer on to the bread dough speed. The Kitchen Aid Stand Mixer is a number 2 setting. Let dough knead for about 10 minutes. Add additional bread flour is the dough is not holding together on the dough hook. This dough will be soft so be careful not to add too much flour. Turn the dough out onto a lightly floured surface and knead by hand for a few minutes. Place in an oiled bowl and turn dough so oil covers the entire surface. Cover with plastic wrap and let raise for about 12 hours. Overnight works really well for this. After dough has risen punch it down and shape into loaves or rolls and let raise until doubled in size. About 2 to hours. 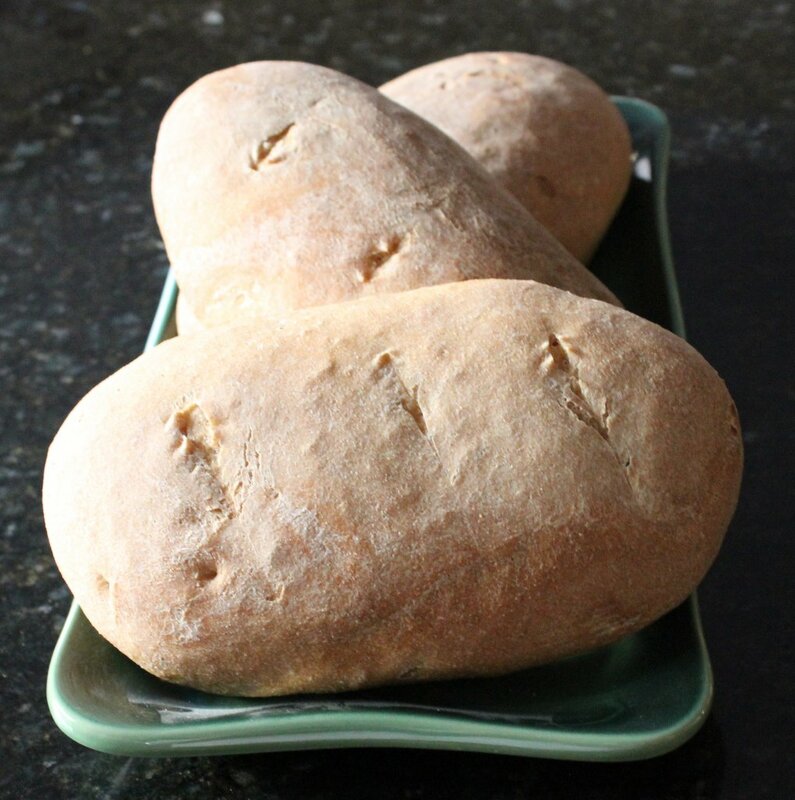 Bread can be shaped into a variety of sizes for baking. Here are the Bread Shapes I use the most often. Preheat oven to 350 degrees F. Bake bread for 30-40 minutes. Bread will be done when brown and crusty and it sounds hollow on the bottom. Or if you put a temperature probe in the middle the interior reaches 190 degrees F.
Note; about 240 grams sourdough starter.